To celebrate the birthday of Susan B. Anthony, honor her legacy, and celebrate the achievement of contemporary women. The Susan B. Anthony Lifetime Achievement Award was established in 1997 by the Susan B. Anthony Center to honor and celebrate women whose lives have been enriched by their years at the University of Rochester and who have, in turn, inspired other women to advance and lead. Nominees are faculty, staff, trustees and/or alumnae who have achieved significant professional stature and influence; have a commendable, trailblazing body of work; and, who have used their experience and skills to help other women advance as leaders. Nominees should have a strong affiliation with the University of Rochester and a “lifetime” of significant achievements. The award is given annually to one woman. Nomination form and details (download). Nominations open until Wednesday, December 5, 2018. The Emerging Leader Award was established in 2018 by the Susan B. Anthony Center to recognize a female leader who is in the early stages of her career. Candidates have made significant contributions to and have strong engagement in the community, demonstrate strong leadership ability, and exhibit high potential for collaboration. Overall, the emerging leader is dedicated to making a positive impact in the University of Rochester and or Rochester-area community. Candidates should have an affiliation with the University of Rochester (staff, faculty, alumna, or community partners). The award is given annually to one woman. Nomination form and details (download). Nominations open until Wednesday, December 5, 2018. Susan B. Anthony’s friends and family first endowed a scholarship in her honor in 1900. The initial $1000 fund was enough to generate $50 a year to provide a full scholarship to a deserving woman student. In the 1920s, Lucy Anthony, Anthony’s niece, made another donation to insure the fund would continue to meet the full cost of annual tuition and fees—$250. Women students at the University have always felt a special bond to Anthony. 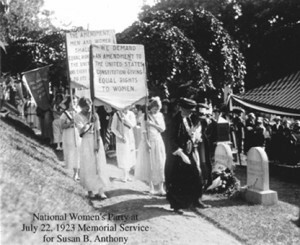 They were honor guards at her funeral in 1906 and, in 1946, the women’s Student Association voted to sponsor an annual Susan B. Anthony Day, scheduled to celebrate her February 15th birthday. A gala luncheon was held, awards were given and internationally renowned women were invited to speak to advance women’s rights. The UR Women’s Club has sponsored this award since 1979. The Susan B. Anthony Scholarship is given to a woman in her junior year who has demonstrated leadership, academic excellence and commitment to her fellow students and community. A student’s financial need is taken into account. The Susan B. Anthony Prize is awarded to a graduating woman student who has shown exceptional leadership, academic excellence and involvement in student life. This prize is specifically for a senior enrolled in a five-year program (such as the 5th Year in Teaching, Take 5, 3+2, etc.). She may be a current fifth-year student or a student about to enter her fifth-year program. The UR Women’s Club has sponsored this award since 1979. Fannie Bigelow was a friend of Susan B. Anthony’s and a fellow-worker in the causes of women’s suffrage, education and independence. She fought on behalf of women prisoners in the Monroe County jail, worked at the Baden Street Settlement House and championed the creation of a Children’s Court in New York State, now the Family Court. Bigelow was chair of the Women’s Education Fund, the committee that raised the $50,000 required by the University trustees to underwrite women’s admission to UR in 1900. The silver trays became a single scholarship to an undergraduate at the recommendation of the Alumnae Traditions Committee in 1972. Given in honor of a present day, dynamic Rochesterian, the Jane R. Plitt Scholarship helps recognize and foster the progressive activism of some of Rochester’s most famous women. Jane Plitt led the local fight to make the Gannett newspapers’ help wanted ads gender neutral. As the National Organization for Women’s first executive director, she helped to open the Kiwanis and Rotary Clubs to women. Plitt is a Visiting Scholar at the University. Her book, Martha Matilda Harper: How One Woman Changed the Face of Modern Business, was published by Syracuse University Press in 2000. Ms. Plitt’s sister and brother-in-law, Arlene and Richard Kossoff, endowed the scholarship in 1999 to be awarded to a woman undergraduate who is a leader dedicated to constructive social change in her community. Sponsored by the University of Rochester Class of 1960 “City Girls”, inspired by Dean Ruth A. Merrill (dean of women 1954 – 1960), this award is presented to an undergraduate woman who has grown up in the Greater Rochester region. The recipient of this award is an ardent advocate for the Rochester region and participates in University and community activities that promote the overall well-being of the residents of Rochester. She seeks to address the disparity of opportunities which currently exist for many people, and to make a difference through her own civic commitment and that of other University students she engages in the work. Applicants must be in good academic (2.0 G.P.A. or higher)and disciplinary standing. This need- based award will be presented at the annual Susan B. Anthony Legacy Brunch. Applications will only be sent to students with financial need as defined by the Financial Aid Office. Also known as the Sue S. Stewart Leadership and Community Service Award, this award, made annually, recognizes a senior woman undergraduate student whose life in the University has been distinguished by a commitment to justice, equality, and community service, as these relate to diversity and inclusion, particularly in the lives of girls and women; and whose activities reflect the spirit of these principles and dedication to these qualities as expressed and inspired by the life and career of former Senior Vice President and General Counsel of the University of Rochester, Sue Stewart.